Anil Kumble, cricketer extraordinaire, has been appointed as the head coach of the India (men’s) cricket team by the BCCI for the duration of one year, today. From the original list of 57 candidates which was pruned to 21, the Cricket Advisory Committee, that included leading lights of the last 25 years of Indian cricket, Kumble has been chosen despite his lack of any previous coaching experience, and despite the prior coaching track record and pedigree of some of those 21 candidates. Kumble’s appointment has been welcomed -based on perusal of social media and news websites -wholeheartedly by fans, journalists and ex-cricketers. There seems to be a general sense of positivity towards Kumble’s reintroduction to the Indian dressing room. Based on what? I do not know. Kumble’s credentials as a cricketer are beyond any doubt. His toughness on the field, his dedication to his craft, his relentless pursuit of wickets in an uncompromising manner, and the dignity with which he led the side before he left the international scene in 2008 are all there for anyone to see, but how do all those qualities transfer to him being a successful head coach, I do not know. Of course, modern day “head coaching” is more man-management than working with the players on an individual basis to correct any flaws in their game. 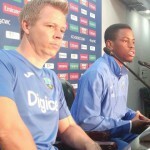 There are assistant coaches for the technical aspects. There are analysts that provide the data and information on trends and tendencies. Gary Kirsten, former India coach himself and a terrific player in his time, said on the Couch Talk podcast that “[t]he ability to get the best out of people [and] skillful man-management” are the most important skills in the modern day cricket head coach. Kumble, after his playing career was over, served as president of Karnataka State Cricket Association, mentor for two IPL franchises (RCB and MI), Chairman of National Cricket Academy, and also in the ICC Cricket Committee. In addition to that, he is also the co-founder of TENVIC, part management, part academy, part consulting company. How do all of this transfer to his likelihood of success as head coach? I do not know. More importantly, how did all this catapult him ahead of the other 20 candidates in the short list? I do not know. Some of those 20 included people who had played the game at the highest level – just as Kumble had, served in various capacities within cricket and beyond, and more importantly have a track record as head coach. For the CAC to pass all of them and make Kumble the head coach, they must have seen something in him – beyond their personal relationships over the last two decades and camaraderie as cricketing team mates – and Kumble must have provided a vision for the Indian team and the ways to achieve them that blew the competition out of the water, but we don’t know. Some journalists – who cover the Indian team closely and have long been following BCCI and its processes – I interacted with after the announcement seemed to suggest that the stature of Kumble as a giant of Indian cricket made his selection to the job an inevitability once he decided to throw his hat in the ring, prior coaching experience or not. If that were to be the case, then the whole process of CAC, minimum requirements, applications, and pruning of list etc., were just a charade. If stature in the game and knowledge of cricket were to supersede any/all of the other requirements for the job, then Kapil Dev would still be coaching, and there wouldn’t have been the bitter break up of Greg Chappell from the Indian team, but we don’t really know. Without any real details on why Kumble was chosen ahead of a long list of equally deserving and well-qualified candidates – and it is highly doubtful that we will ever be privy to that, we can all feel “positive” about the appointment but that is just living in hope rather than anything based in substantive evidence beyond the obvious facts of his extraordinary playing career. I say this because there has been an overwhelming approval and embrace of the choice of head coach that the underlying processes in selecting the best available person have been thrown out the window. When support of decisions is made based on personality rather than actual vetting of qualifications, the scrutiny that will inevitably follow will also be based on “gut feelings” and “vibes” rather than grounded in facts and evidence, and that is a bad situation for Kumble – with all of his 619 Test wickets – or anyone else. What is integrity? It is the exact manifestation of inner values as outward actions. We expect integrity of ourselves, and of our leaders and our governments. Society is a fragile construct and without the essential glue of integrity, it would fall apart. Sports have a major role in our society and are subject to the same expectations of integrity. The people watching and supporting it need to have the confidence that the contests upon which they are expending enormous amounts of emotions, time and money are fair. Hence the need for drug testing and constant vigilance against fixing, bone density tests and corruption. But these measures only apply to the participants in the contests themselves – the athletes and the players, but not to the ones that are governing and administering the sport. Case in point: Cricket and the ICC. The ICC includes “Fairness and Integrity” in the set of values that drive its goal of making cricket “a bigger, better global game”. But even a casual look at some of its conduct in the recent years would show that its outward actions are not the manifestation of its stated inner values. Three years ago, BCCI, ECB and CA ran roughshod over the organization and its principles in what can only be called as a naked money grab, while the other ICC members allowed it to happen, motivated by their own greed and needs. With change in personnel, some of the damages from the Big Three takeover are being undone, while some will forever stick. The underlying thoughts are easy to comprehend. ICC is beholden to the broadcasters (in this case, STAR) and had to ensure the broadcasters will get the bang for their buck, integrity of the draw be damned. Ever since the 2007 ODI world Cup when India and Pakistan failed to progress beyond the first round, and the broadcasters suffered losses, ICC has been bending over backwards to ensure, first and foremost, the interests of the broadcasters are catered. It is no surprise that Mr. Richardson could talk on one hand about meritocracy of promotion and relegation in the proposed two divisions of Test cricket, while also saying that “[n]o doubt we want to try to put India versus Pakistan in our event”. The two divisions will be made of 12 teams, 7 in the first division and 5 in the second. You might wonder why 7 and 5, and not the seemingly obvious 6 and 6. 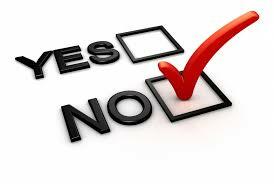 First of all it takes 7 votes (of the 10 Full ICC member nations) to pass a proposal and secondly, keeping it at 7 guarantees that the big TV markets are all part of the first division, and hence makes it a lucrative product for the broadcasters. Any which way you turn in cricket, it is impossible to miss the conclusion that it is the broadcasters that dictate the proceedings. Cricket has caught on so firmly to the teats of the broadcasters for its funds that any other financial model that doesn’t make the sport a slave would require a complete overhaul of the sport itself, and that would require tremendous will and vision from the member boards. But why do the hard work of steeling the sport with a strong back bone of integrity when you can just wheel and deal, and ensure the fans get to watch over-hyped rivalries from time to time? Sure, Champions Trophy 2017 would be the *sixth ICC event in a row where India and Pakistan have been scheduled to meet in the group stages, but we are giving the broadcasters fans what they want. You really want to know how much ICC really cares for the integrity of the sport and the results of its contests and not the broadcasters? You will have to look no further than the Duckworth-Lewis method (now modified as DLS) it had adopted to artificially arrive at the result of a cricketing contest. When the result of a game, and basic belief of players and the fans that “anything can happen” till the last ball is bowled or the last out is made, is compromised at the altar of expediency and profits, we can expect no better from the administrators than to rig the schedule to ensure broadcasters – profit-driven corporations – are not discomforted in any manner. During the recently concluded World T20 held in India, there was so much hoopla surrounding the India-Pakistan game. After all the politicking of venue, security etc., were done, the stars and the celebrities showed up en masse at Eden Gardens for this marquee match up. While Amitabh Bachchan and Mamta Banerjee were singing praises and covering themselves in patriotic glory in Kolkata, there was another India-Pakistan match in Delhi that was brought to an abrupt, artificial conclusion. Defending a seemingly small total of 96 runs, the Indian Women had reduced Pakistan to 77/6 in 16 overs when rain interrupted. Even as rain relented, and the sun shone bright with the ground ready for play, the game was called off with Pakistan declared winners by 2 runs using the DLS method. Care to venture why? The broadcasters needed the cut off time so that their transmission from Kolkata of the pre-match nonsense preceding the clash of the arch-rivals could go unhindered. Who knows what could have happened in that Women’s game? Who knows how the rest of the tournament would have panned out if India were able to defend their low total? We will never know. So much for integrity of sporting results. It isn’t just that a draw for a tournament is rigged to ensure best possible outcome for the broadcasters, or that a statistical device is used to conclude a sporting contest to ensure no undue burden is placed on the broadcaster, or that boards with the bigger muscles bullying the others in to compliance; These are only the things within cricket we know of. But once we are willing to compromise on the integrity of a result, or a draw, we can extend it to almost every decision that’s taken in running the sport so that it satisfies the broadcaster or whoever the big boy at the table is, or what’s convenient, and that isn’t good for the sport or the society it lives in. – Thanks to @shyamuw for catching the error. The original version said 2017 Champions Trophy as fifth ICC event in a row where India and Pakistan are scheduled to meet in group stages. I have decided to take an indefinite – and most likely infinite – break from Couch Talk Podcast. The podcast started as a hobby and was something fun to do in my spare time. I had lost the fun quotient of it a few months ago but kept motoring on till the thought formed fully in my mind that I was done with it. Today is that day. Thank you all for your wonderful support with your constructive criticisms, feedback, sharing and pushing me to do more with the podcast. A lot of people played significant roles in the shaping and growth of the podcast, and in its visibility. I am grateful for that but I want to give specific thanks to Jarrod Kimber, Siddhartha Vaidyanathan, Kartikeya Date and Shrikant Subramanian for all they did for the podcast. Thanks to all the folks that appeared as guests on the show. Without their generosity -of time and thoughts, the show would be nothing. I cannot thank Bharathram Pattabiraman enough for all the tireless transcribing he has done over the years. His help was instrumental in Couch Talk finding a larger audience. A huge thanks to Aravind Murali (now a National Award winning music composer) for composing the intro music in a matter of few minutes and letting me use it for all these years. Thanks are to Sunny Mishra for helping me set up the feeds on iTunes etc. Thanks to ESPNcricinfo for featuring the podcast on their site, first as a part of the Cordon blog and later as a Feature. I had some ideas and reasons behind starting the podcast and doing it for nearly 5 years (The first episode was published on June 2, 2011). I knew I was doing something right when a former international captain said, “It’s a good thing you are doing. Keep it up.” But all things must pass. It sort of feels sad but 189* is not a bad time to leave the game. The King will be proud. 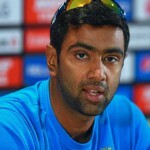 Indian spinner R Ashwin discusses the role of spin bowling in T20s, the asymmetrical contest of bat v ball in T20, and states that people ought to consider T20 as a different sport and not even part of cricket. 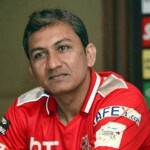 Former India cricketer and currently their batting coach Sanjay Bangar talks about the responsibilities of his job, the influence of a great generation of batsmen like Sachin Tendulkar and Rahul Dravid on the current side, batting plans in Tests vis-a-vis limited overs, and how he works with players going through a rough patch etc. 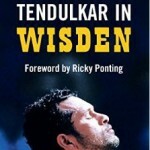 Anjali Doshi, editor of “Tendulkar in Wisden” talks about the idea behind the Wisden Anthology, the process of distilling 24 years of writing on Tendulkar in Wisden, her own experiences of covering Tendulkar and discusses the Sachin phenomenon that transformed from being about a great player to the level of infallible. The book is available from Bloomsbury (LINK) and Amazon (LINK). 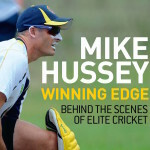 Former Australian batsman Mike Hussey talks about his new book “Winning Edge: Behind the scenes of elite cricket”, his coaching philosophies, the change in T20 batting approaches, and the various captains he’s played for, amongst other things.